As is well known to viewers of the Jurassic Park films, palaeontologists have been keen to extract DNA from extinct animals. The early excitement has given way to a more sober view that DNA cannot survive for more than 100,000 years or so, and may be useful only in studies of Pleistocene animals. Hendrik Poinar and colleagues from the University of Munich have been searching for DNA in bones, hair and even excrement. 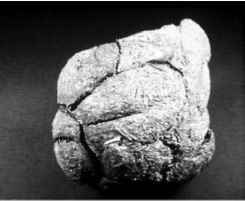 They hit a rich trove of DNA in the coprolites (fossil excrement) of the Shasta ground sloth Nothrotheriops from a dry cave in Nevada (Poinar et al., 1998). The DNA included segments of xenarthran sequences, closest to known sequences from ground sloth bones, presumably derived from cells sloughed from the gut lining. In addition, there were sequences from at least eight plant families, including grasses, yucca, grapes and mint. These identifications are confirmed by careful work on the coprolites, which can be teased apart to reveal partially undigested bits of leaves and seeds. The DNA technique also works on thoroughly chewed food that cannot be identified by eye. empty. The giant ground sloths were no doubt encountered by early man: were they hunted to extinction? Specimens found in caves often have clumps of their yellowish and red hair still preserved, and thick accumulations of their dung in some South American caves have been known to ignite and to burn for months (see Box 10.5). The ant-eaters (Myrmecophagidae) have a much poorer fossil record than the armadillos or sloths. There are three living genera, Cyclopes and Tamandua (Figure 10.19(f, g)), which live in trees, and the terrestrial Myrmecophaga (Figure 10.19(h)). The snout is long and toothless and it houses a long sticky tongue rooted far down the throat about level with the sternum that can be shot out to capture small insects (Figure 10.19(g)). The oldest purported ant-eater comes from the famous Eocene lignite deposits of Messel in Germany (Storch, 1981). Eurotamandua (Figure 10.19(i, j)) is very like the living ant-eaters except that it retains a narrow zygomatic arch. What this unexpected find tells us about the geographical history of the group is a mystery. Delsuc et al. (2001) suggest, however, that Eurota-mandua may not be a xenarthran at all, but simply an unrelated ant-eating placental mammal that shows chance convergences. (Cifelli, 1993b), the litopterns and relatives deriving from North American mioclaenids (Muizon and Cifelli, 2000). The litopterns include a range of rabbit-, horse- and camel-like forms. Diadiaphorus from the Miocene and Pliocene (Figure 10.20(a)) is a lightly built animal with many striking convergences with horses. The legs are long and only the middle toe (hoof) touches the ground (Figure 10.20(b)). Some litopterns have the nostrils set well back in the skull roof, which almost certainly indicates the presence of a tapir-like trunk, as is seen in the superficially camel-like Macrauchenia from the Pleistocene (Figure 10.20(c,d)). The notoungulates are by far the most diverse of the South American herbivore groups, with well over 100 genera (Cifelli, 1993b). Their ear region is greatly expanded, with additional chambers above and below the normal middle ear cavity, and they are characterized also by having a particular pattern of ridges on their molar teeth. Most notoungulates retain the primitive total of five fingers and five toes on each foot. The early notoungulates, forms such as Notostylops from the Eocene (Figure 10.20(e)), have a diastema, or gap, between the large nipping incisors at the front and the cheek teeth behind. Already, in this early form, the incisors are enlarged and the canines reduced. In later notoungulates, the canines often disappear and the incisors become ever-growing, like the gnawing teeth of rodents (see p. 355). 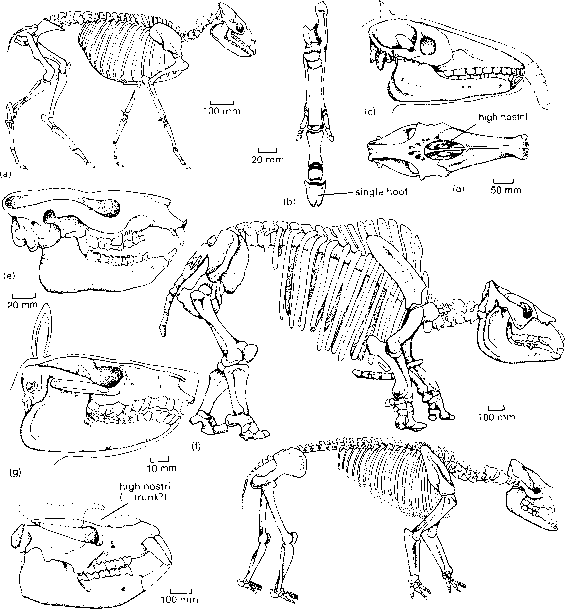 Many of the typotheres, such as Protypotherium from the Oligocene (Figure 10.20(g)), were rabbit-like animals, although some became as large as bears. Protypotherium has a continuous battery of shearing teeth, with no sign of a diastema. The ty-potheres include forms with reduced numbers of digits, down to two toes and three fingers in some species. The largest notoungulate, Toxodon (Figure 10.20(f)), was first collected by Charles Darwin in the Pleistocene of Argentina. He described it as 'perhaps one of the strangest animals ever discovered'. As in the notoungulates, the roots of the teeth remained open thoughout life so that they continued to grow to keep up with the wear produced by grazing. trapotherium from the Oligocene and Miocene (Figure 10.20(h)) is as large as a rhinoceros. It has a long body and short legs. The lower incisors stick out straight in front and may have been used in digging for water plants and roots. The pyrotheres from the Eocene and Oligocene are also large long-bodied animals with trunks. The skull (Figure 10.20(i)) is short and bears broad tusk-like incisors. The xenungulates, cryptic forms from the Palaeocene, may be related to the pyrotheres, or even to the northern-hemisphere uintatheres (see p. "),but this latter suggestion seems unlikely (Cifelli, 1993b). Several smaller groups of placental mammals invaded South America during the Tertiary. For example, rodents appeared in the Eocene and bats arrived at least by the late Oligocene. The South American rodents became important elements of the faunas and some reached large size (see p. 358). Primates also reached South America in the Oligocene and gave rise to a radiation of marmosets and monkeys (see p. 371). The invaders are termed 'waifs' because the first bats, rodents, and primates to reach South America were probably small populations that had arrived by chance dispersal events. All of the South American ungulates have gone, as have the larger carnivorous marsupials, glyptodonts and ground sloths. These extinctions in the Pliocene and Pleistocene were once explained as a result of the opening up of the Central American land bridge about 3 Myr ago (Figure 10.21), but a closer look at the evidence shows that this is incorrect. North American mammals such as raccoons, rabbits, dogs, horses, deer, camels, bears, pumas and mastodonts headed south, while South American opossums, armadillos, glyptodonts, ground sloths, ant-eaters, monkeys and porcupines headed north. This transfer of mammals has been called the Great American Interchange (GAI). The standard explanation for the GAI has been that the 'superior' northern migrants wiped out the weaker southern mammals by intensive competition. But this view has been challenged and a range of detailed studies show that the interchange was much more complex (Stehli and Webb, 1985;Marshall, 1988). Marshall et al. (1982) have shown that, at generic level, the GAI was balanced in terms of relative land areas. The classic story at first seems to be confirmed: 50% of the present-day mammal genera in South America are derived from members of immigrant North American families, whereas only 21% of the present-day mammal genera in North America had their origins in South America. 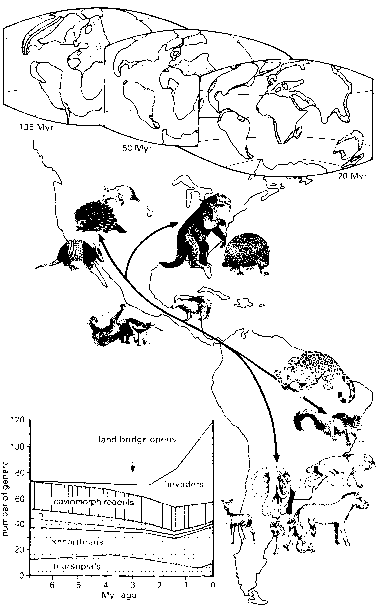 The total number of mammal genera in South America, however, increased markedly after the land-bridge appeared (Figure 10.21), and this increase consisted of North American immigrants that 'insinuated', that is, they exploited additional niches without competing and causing extinctions among the genera already present. South America and North America show similar levels of extinction of invading genera immediately after the formation of the land bridge. The major extinctions affected South American ungulates and xenarthrans. Were they inferior to the horses and deer from North America? The litopterns and notoungulates were already declining before the invaders arrived, and the surviving lines died out much later along with their supposed competitors, the invading mastodonts and horses. Further, the glyptodonts, ground sloths and toxodonts were so different from the North American forms that it is hard to see how they could have competed. Fourthly, when all of the genera of large herbivores are added together, it is clear that no gradual replacement took place—the numbers of genera of South American forms went down from 26 to 21 after the interchange and then rose to 26 again. The Pleistocene extinctions (see pp. 359-62) cannot be explained by the invasions 2.5 Myr before.